I was invited by Capt Tyler Roundtree of the Meridian Fire Dept to attend their first attempt at putting on a training program called Fire Ops 101. This program is used in the Tri-Cities area to train elected officials and press on the daily challenges our first responders face on a daily basis. While most of us have a hard time carving out a few days in June to drive to this training, it was especially hard this year due to our extended session. All of us legislators are now trying to catch up on work and the "honey-do" lists that have been put on the back burner. Having Fire Ops 101 done locally was a real blessing for those of us that were able to attend so we could get this important training allowing us a glimpse into their daily work lives. Meridian has a great training center to do this training, a 4 story brick building with rooms for fire training, smoke rescue training and even law enforcement training. A 6 story tower enables stairwell and repelling training as well. They have an outside flash over demonstration room (3 walls and roof) where you can see a typical room start on fire and then watch as the fire progresses and how quickly it moves (doubling in size every 45 to 60 seconds!). In the picture above, I was clean and just getting ready... that changed very quickly. Lots of soot and working on your knees or bent over to stay under the heat and smoke of the burning room. We had to haul hoses into the "house" around corners and to the fire or to the point were we could provide safety for those who's turn it was to attack the fire. Wearing their "turnouts" (the typical fire fighting pants and overcoat) was at first very enlightening, then challenging... between those and the Scott air packs we used, the total weight was an additional 60 lbs at least! Adding that extra weight to the activities along with the great insulating factor provided by the turnouts made for a very hot working environment... I can't ever remember drinking so much water and sweating so hard, and I've sweated in some very strange places in this world! We were blessed that the outside temps had dropped to ~75'... I can only imagine doing this in 90' or 100' temps! Next, Natalie Hurst (Channel 2 News Anchor) and I had the "pleasure" of hauling out a 24' ladder that enabled us to climb to a roof over a burning fire with a running chainsaw to cut out a hole enabling venting of that fire below. This venting provided a safer environment for those below fighting the fire. After climbing down, we were directed to climb a 100' ladder to the top of the 4 story building and simulate doing a "recon" of a building for things that the firefighting team should know about. Thankfully, between all of these events we were able to recharge with water and Gatorade... a cool down period is necessary for these guys (and us) as one would quickly fall to heat stroke without some cool water and venting the heat out of the turnouts. We each had a fire fighter that was assigned as our "shadow" to make sure we didn't do anything stupid, ensure our safety and to answer any questions we might have. Chris was my shadow and did an excellent job of teaching me about the little things that could/would get me hurt if I wasn't paying attention. After cooling down, we headed to a simulated car accident where we were trained and used the jaws of life to cut off a roof and take out the window of a car, pull out victims, put them on a backboard, do CPR and then discussed the impact of EMS services with the a local St. Lukes Emerg room doctor and advisor to the Meridian forces about EMS impacts to saving lives. ... cool down (needed, these jaws of life tools weight about 60-80 lbs and are not easy to manipulate quickly in heavy/hot gear)... but it was cool tearing apart the car in just a couple minutes! We then were directed to the 3rd floor where a typical room was set up with 2 victims that were downed with smoke. This room was so full of smoke, even on our knees, we could not see anything... not even our hands in front of the air pack mask. We were taught how to go into a room without getting lost and stay together and do a search for the victims and then bring them out. From my point of view, this was the hardest task of the day. I led in first with my partner from the Idaho Statesman at my side while we both searched a room in the dark for victims. I missed the first one, just never felt the body and kept searching until we found a "child" across the room. We drug him out, again while not getting lost from where our exit was and I was exhausted... only to be told we had a second victim and had to get back in there and find them! My Statesman partner led the way this time and we quickly found the adult to drag out... holly smokes, this dude was heavy! Again, with the added weight of the equipment we were wearing and the weight of the bodies (dummies) we were towing out, made for a tough activity. While we were doing these various training programs, the on duty fire fighters were called out on a fire... to my surprise no one missed a beat, everything just went on as normal. I was amazed at how well coordinated these folks are. All of the folks doing the training were off duty and came in on their own time to put this program together. They knew the on-duty folks could handle the call and never blinked... that's the trust they have in one another. Personally, I'm glad I did this here at our Meridian facility. Not only did I learn about the various issues our men and women face daily, but I learned about coordination efforts between our Treasure Valley EMS programs from Boise to Nampa and how everyone works together, but also some of the continued challenges that we still face and need to overcome. 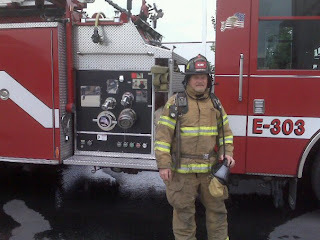 I doubt that I would have gained that vision by going to the Fire Ops training in the Tri-Cities. I gained a increased appreciation for what these folks do for us day to day, most of the time going unnoticed by most of us as "just business as usual". It's never "business as usual" for them and it shouldn't be for us. If you see one of our first responders heading for "work" give them room and a wave and let them know you too appreciate what they do for our city.